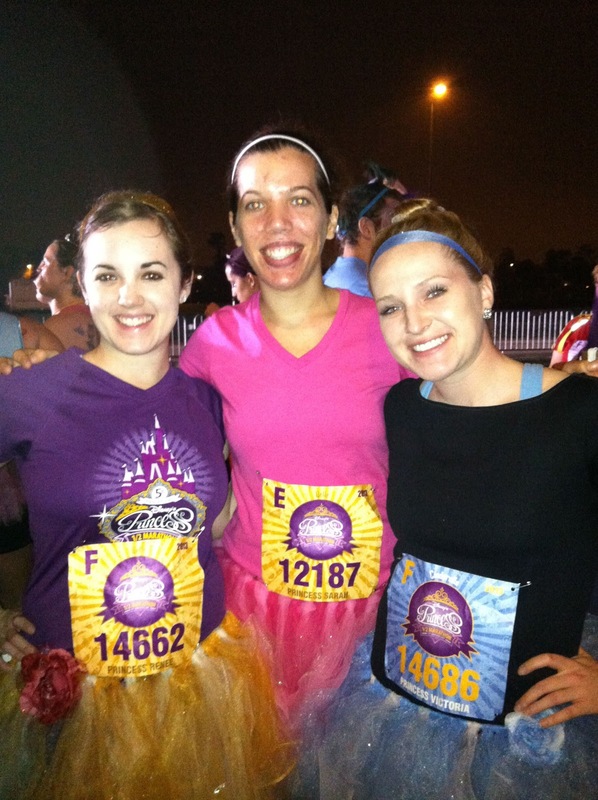 But first - a recap of Disney's 2013 Princess Half Marathon! If you read my last post, you may have realized that I was a little bit terrified to run this race. I took it very easy before the half marathon, and decided not to do any big long runs prior to it. I figured that if I had made it through several long runs that went well past the 13.1 mile mark, as well as making it through the marathon in January, I could do one or two medium length runs before the Princess and be totally fine. So that's what I did. I took it easy, and ended up only doing one 7-miler the day after Valentine's Day, about a week and a half before the half marathon. It ended up being a fantastic run, one of those life changing runs where you don't want to stop at 7 miles, you want to keep going forever. I got to pet a gorgeous calico cat that was randomly in the grass, listened to awesome new music on my iPod, and saw a beautiful sunset. I couldn't have asked for a better run to get my spirits back up in time for the race. 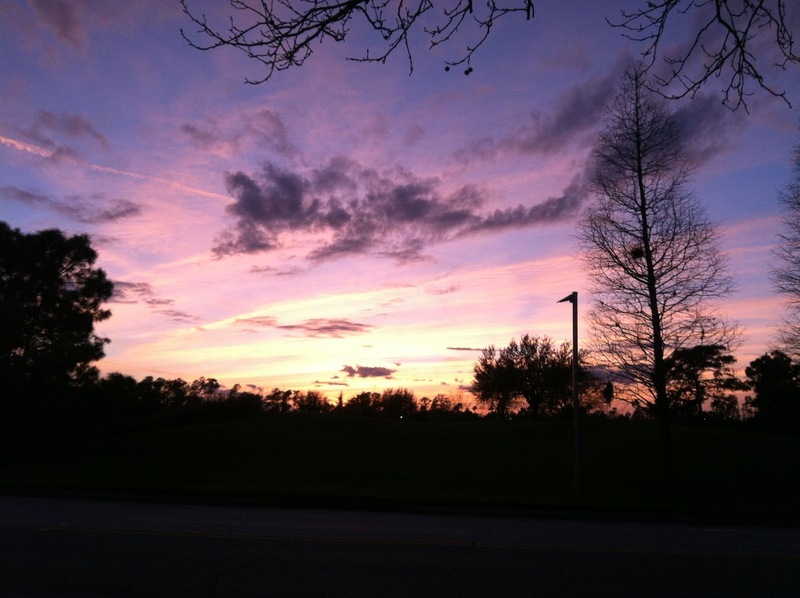 That was my gorgeous view near the end of the 7-miler. Before I knew it, the expo was up and running and you all know that I can't miss a reason to spend money on sparkly things, so I went as soon as I could. 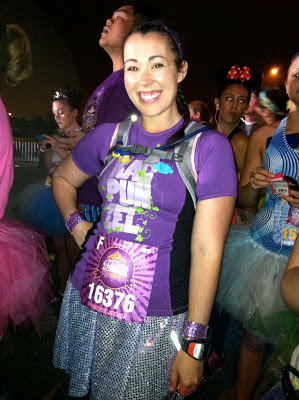 I ended up buying a sparkly skirt to wear for the race, which was SO FUN and I will absolutely be doing that again. I also bought a few shirts from Raw Threads because I love pretty much everything they make (I wore their Rapunzel shirt for the race itself, but I'll get there) and I couldn't resist buying the new Princess Half Marathon Dooney and Bourke bag as seen here. I got the tote bag and the wristlet. I have a serious problem with wristlets, and even though the Dooney and Bourke bags are pricey, I do get a Cast Member discount on them and I love them so much that they are worth it. I tried to relax as much as possible before the race itself, but I ended up not being able to sleep much the night before. Thank goodness that I'd gotten a solid night of sleep on Friday night because Saturday night, I was wired for some reason. I got Chinese food with Jamie for dinner on Saturday, which I think will be a new pre-race tradition - we had Chinese food the night before the full marathon too, and I think it's a perfect mix of salt and carbs for me. Plus, I just really like Chinese food. Sunday morning I got up early and had an egg and some toast, which seems to work well for me as a pre-race breakfast (read: I've done it twice and it hasn't killed me yet, so I'll keep it). 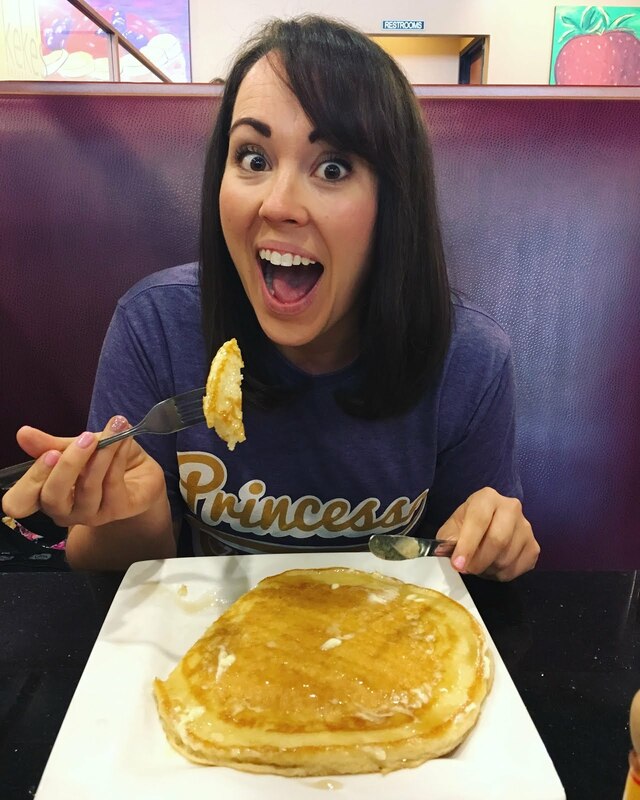 I got dressed in my Rapunzel outfit - with the Princess Half Marathon, you pick your favorite princess when you register and your bib is the same color that your princess wears. 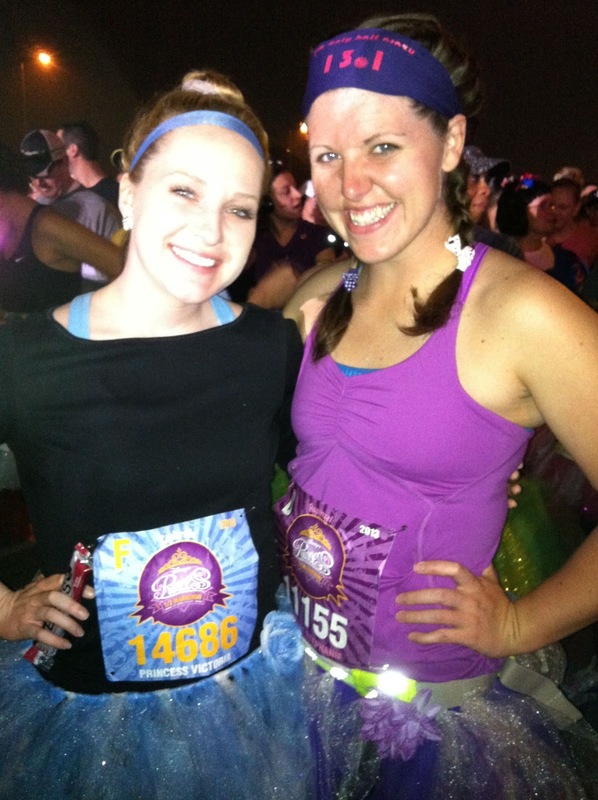 So my bib was purple for Rapunzel (love her) and said "Princess Jessica." I have to say that this is by far one of my favorite parts about this race - everybody played into the princess theme. There were volunteers handing me water and telling me it was "special princess water" and every five seconds someone was calling you a princess. Normally I'm not big on the whole "I'm a princess!" thing, but it was really fun. After I got dressed and ate breakfast, I gathered all my gear up and drove myself over to Epcot. One of the reasons that I signed up for this race in the first place was because several friends of mine were doing this as their very first half marathon. I met up with them and we all started in the same corral together. Obviously this meant it was time for pictures, since it was 5 am and we'd all gotten about 4 hours of sleep. Stephanie and Vicky before the race, both first time half marathoners! Renee, Sarah, and Vicky - Renee was also doing her first half marathon, Sarah was a seasoned pro. Yours truly! Look at my eyes and see how awake I am. As you can see from the picture, I kind of went overboard on the sparkly things. I have a sparkly skirt, a sparkly headband, and sparkly cuffs that I got at the expo from the lovely ladies at Team Sparkle. You know what I learned about going overboard on sparkly things for a race? THAT I SHOULD DO IT ALL THE TIME. Next time I might try to coordinate better, but I am getting all dolled up for every race now. It was just too fun. I took my ClifShot about 20 minutes before our corral was set to start, and got ready to go. When we started, Vicky, Renee, and Sarah took off. I think when I told them "don't try to stick with me, I am slow" they thought I was kidding. It wasn't until I started jogging along at probably a 15:00 minute per mile pace right off the bat that they realized how slow I really was. I told them to go ahead and that I would see them at the finish line. 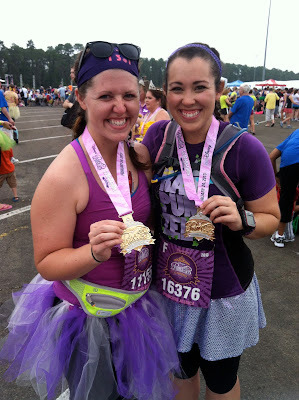 But Stephanie stuck with me, and we realized that we were pretty much running at the same pace. Cue feeling really stupid for not doing a single training run together. I wasn't expecting to be running the race with someone else because truth be told, aside from a couple short runs that I dragged David on with me a long time ago, I have never run with another person. I had my iPod all prepped with brand new music to get me through a very slow half-marathon, but it became pretty clear that Stephanie and I could stick together the whole race. I put my iPod away and just talked with her the whole time and honestly, it was fantastic. Time flew by. We went very slowly, but since it was my first long run since the marathon and her first half marathon ever, it was okay. Neither of us was going for a record breaking time. Mostly we just had a great time. I kept her going when she was struggling, and she kept me going when I started to hit a wall. I honestly don't think we would have had as good a time by ourselves. It was one of my favorite races ever and I am so glad that I got to share the experience of her first half marathon with her. I also really enjoyed the course that this race took. 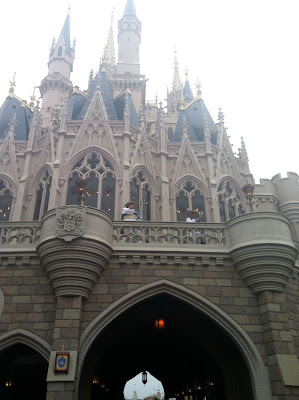 One of the issues that I had with the Walt Disney World Marathon and the Wine & Dine Half Marathon was that I didn't really care for the course. For the marathon, it was the speedway that really got to me, and for Wine & Dine it was... well, everything, because that was just not my race. 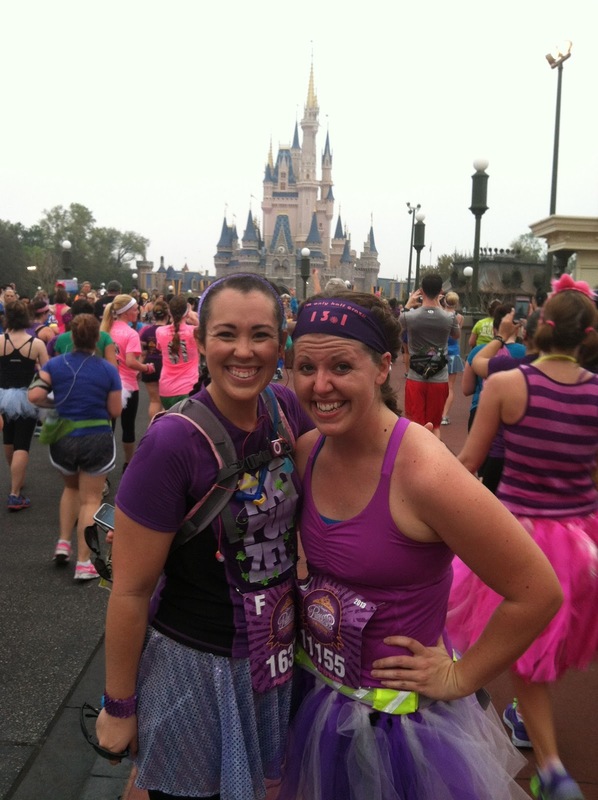 The course for the Princess Half Marathon was great! Not only did we get to go into Magic Kingdom, but we really got to run through the park, which was so fun. All in all, even though it was a very slow race for me (my final official time was 3:17:59, which was still faster than my time for Wine & Dine, 3:20:24), it was fantastic. We also stopped for several pictures, so I knew my time wasn't going to be impressive and I was completely okay with that. I honestly enjoyed the whole thing, and for the first time, felt like the Run Disney slogan of "every mile is magic" was true. Of course there were tough spots - it's a half marathon for heaven's sake, it's not going to be a joy ride the whole time. But the weather was great, not too hot and wonderfully cloudy, the course was fun, and it was honestly really nice to run with someone! So thanks Stephanie! The medal is gorgeous and I will post close up pictures of it soon, but there's one more person I have to give a shout out to on this recap and that is my amazing boyfriend. Not only was Jamie waiting at the finish line for me, he was waiting at the finish line with TWO CHOCOLATE DONUTS. I love that man more than I can even explain.